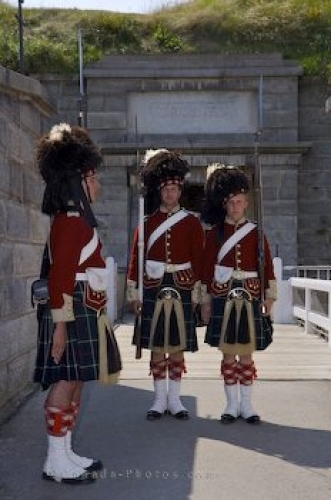 Dressed in their full uniform, guards march step by step at the Changing of the Guard which takes place at the Halifax Citadel National Historic Site in Nova Scotia, Canada while visitors watch. The Changing of the Guard is an event that must be seen and it takes places every hour at the top of the hour at the Halifax Citadel. Changing of the guard at the Halifax Citadel National Historic Site, Halifax, Halifax Metro, Nova Scotia, Canada. Photo of the Changing of the Guards at the Halifax Citadel National Historic Site in Nova Scotia.